Meet the average Spokanite: He's partway through his 79 years, in good health and satisfied with his life. (Or so he tells the state Department of Health when asked.) But what are the chances he was bullied or suffered from depression as a child? Is he overweight? Insured? Did he get the flu shot? Data can help answer those questions, propelling certain issues to the forefront of public health policy and eventually improving the health of an entire region. A new report from the Spokane Regional Health District provides the latest snapshot of health in the county. The latest biannual "Spokane Counts" report details 61 "indicators" ranging from the rates at which we binge-drink and exercise to how many children are immunized or abused. The data comes from a variety of local, state and national records, like the Centers for Disease Control and the U.S. and Washington state Departments of Health. 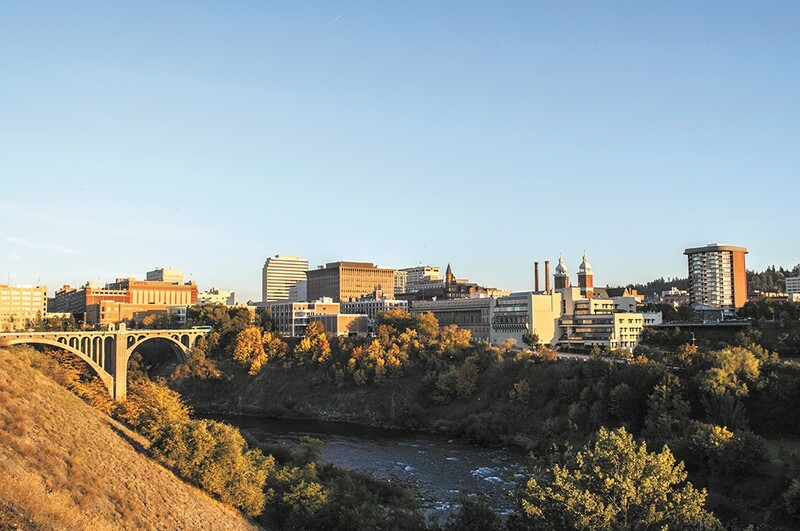 A team from the Spokane Regional Health District analyzed disparities among races, genders, income groups and other demographics within each indicator and compared local data for each one to previous years' measurements, state and national data and goals for 2020. A final score — the sum of each measurement and comparison — was assigned to each indicator. Those scores reveal stark successes and needs, which can, in turn, help guide public health policy and education programs in the community. "It wasn't the intent of this report to identify what's going on behind each indicator," says Spokane Regional Health District epidemiologist Adrian Dominguez, who authored the report. "It's just to identify what are the problem areas. ... It's for the entire county to look at, for us to work with one another to put our efforts together and address these problems." This year's results are stark: many indicators are improving steadily in our region, like physical activity and drug use among youth, smoking among adults and youth, and food security for children. Others, like youth depression and bullying, are worsening. "What we've seen is an increase in stuff that deals with mental health and things associated with youth as well," Dominguez says. "Those are things that maybe [have] existed but we haven't really focused in on them, because we didn't have the information to support that." Find the full report, including more detailed data about each indicator, at srhd.org/spokane-counts. Twenty indicators made the report's "not meeting expectations" list, and some of them are especially startling because they haven't progressed over previous years. Preschool immunizations, credited in public health with controlling diseases like measles and whooping cough, are down 17 percent since 2008. Among mental health and violence issues, bullying and youth depression are both up, with significant disparities between race and education groups. As technology has emerged that enables bullies to torment their victims in new ways, the issue has come to the forefront nationwide, and Spokane is no exception. The percent of youth in grades 6, 8, 10 and 12 who say they've been bullied in the past month has been on the rise in Spokane County since 2008. Elaine Conley, community and family services director at the health district, says those numbers — and others, like higher rates of youth depression — may be indicative of family and community pressures bullies are facing outside the classroom. Poverty and low education levels in Spokane County can contribute to family stress, and as the economy has lagged in recent years and families have suffered even more financial strain, children are being exposed to more even more tension. "There are a lot of poor families in this community, and I don't think the general public, for the most part, understands the stress these families are under," Conley says. "Some of these parents are working two and three jobs just to keep a roof over their family's head and to get them basic food. Stress is coming out in various ways. Smoking is one, drinking may be another, and certainly violence is part of that mix." Along with asking whether Spokane's numbers are improving or worsening, measuring whether we're keeping up with national and state progress can provide context. Even in some areas where we're improving, like smoking among pregnant women, the region remains far behind. Among Spokane's biggest challenges highlighted in this set of data is smoking among pregnant women. It's a practice that not only presents well-known dangers to the smoker, but can result in low birth weight or preterm birth, according to the health district. In Spokane in 2011, the rate of births to women who smoked during pregnancy was nearly twice the statewide rate. Again, says the health district's Conley, Spokane's lower rates of education and income are at play. Younger women with less education and lower incomes, often facing more stress just to survive than their richer or better educated peers, are more likely to smoke during pregnancy than women who are older than 25 or have some college education. In an effort to address the problem, the health district offers a program partnering nurses with low-income families and first-time pregnant women to educate them on healthy practices and help them set goals. Conley says empowering them to prepare for their new family can "create a sense of hope within these young women, who may have never been able to see a future for themselves, much less their unborn child." Many of the indicators show progress, but even among those are challenges. Binge drinking by youth (grades 6-12) fell 7 percent between 2006 and 2012, but still exceeds the state rate and includes major disparities depending on gender, race and how well educated the child's mother is. Similarly, nearly 14 percent more young people are physically active than in 2006, but racial disparities show there's still work to be done. Among adults, smoking rates are decreasing and flu shot rates are increasing over the long term, but from 2010 to 2011 both took a step back, showing the opposite results (increased smoking, decreased flu shot rates). A common thread in public health is the focus on children. Even through high school they're still developing, which means they're ripe for starting good health habits — or bad ones. Helping youth develop healthy habits can have positive effects into adulthood, not just on their health but on their cost to the health system as a whole. Children who are food-insecure — those "who had to skip or cut the size of a meal in the last year because there wasn't enough money for food" — not only risk poor health, but the establishment of poor eating habits, like low fruit and vegetable intake. This year's Spokane Counts report shows a continuing decrease in food insecurity among youth (grades 8-12), though disparities exist: The percent of black children who had experienced food insecurity was twice that of white respondents, and the rate among children whose mothers had not graduated high school was more than three times that of children whose mothers were college graduates. In her role as a "healthy communities specialist" at the health district, Natalie Tauzin focuses on preventing chronic disease in various ways, including by improving eating habits. She credits multiple efforts for increasing children's access to food: local food banks, backpack programs, which send food home with children over the weekend, and school breakfast programs, which are encouraging more students to make breakfast a daily habit. Looking to the future, Tauzin is hopeful a new food policy council made up of local leaders can create "policy priorities" that address food security for the entire county. "As a community, many, many nonprofits are addressing food insecurity in lots of different ways," she says. "Smaller programs continue to try to chip away at this, but ideally it will be something that comes on multiple levels."